Dr. Larry S. Sherman is a Senior Scientist in the Division of Neuroscience at the Oregon National Primate Research Center and an Associate Professor in the Department of Cell and Developmental Biology, in the Neuroscience Graduate Program, and in the Program for Molecular and Cellular Biology at the Oregon Health & Science University. He has over 60 publications in the areas of developmental neurobiology, glial cell biology, demyelinating diseases, and neuro-oncology; serves on numerous research advisory panels and grant review panels, and is a member of the editorial board of the journal Glia. In 2007, Dr. Sherman was elected Co-President of the Oregon Chapter of the Society for Neuroscience. Dr. Kerstin Feistel is a postdoctoral fellow in the laboratory of Dr. Larry Sherman at Oregon Health and Science University. In 2003, she received a degree in Biology from the University of Hohenheim in Stuttgart, Germany. As a graduate student holding a fellowship from the Boehringer Ingelheim Funds, she worked with Professor Martin Blum at the University of Hohenheim. Her PhD thesis focused on the study of growth factor signaling during embryonic left-right specification, for which she received her doctoral degree in 2007. She is now studying the role of hyaluronan as a signaling molecule in the neural stem cell niche in mouse development and disease. The mammalian central nervous system (CNS) is comprised of a wide variety of neurons and glial cells (astrocytes and oligodendrocytes) that are derived from neural stem cells (NSCs). NSCs are a self-renewing population of multi-potential cells that, in the embryonic nervous system, are located adjacent to the lumen of the neural tube in a region that becomes the “ventricular zone” (VZ; Fig. 1). NSCs also give rise to progenitor cells that can persist as undifferentiated or immature populations, which can later be recruited to replace dead or damaged cells following injury or during the course of normal development and aging 1, 2. Early development of the CNS. The CNS originates from the neural tube (shown on the left) while the peripheral nervous system arises from the neural crest, a transient population of cells that migrate from the dorsal neural tube. In the developing brain, the lumen of the neural tube becomes the ventricles where cerebrospinal fluid flows. Adjacent to the ventricles is the ventricular zone (VZ) and, later, the subventricular zone (SVZ) where NSCs reside. In the cerebral cortex, the neurons and glia that differentiate from NSCs in the VZ and SVZ migrate through growing layers that come to include the intermediate zone (the future white matter), the subplate (SP) and cortical plate (CP) that will include the deeper 5 layers of cerebral cortex, and the marginal zone (MZ), which contains horizontal fibers and early neurons just below the pial surface of the brain. The VZ and SVZ both constitute NSC niches where NSCs self-renew through symmetric cell divisions and differentiate through asymmetric cell divisions. NSCs and progenitor cells persist in the adult mammalian CNS throughout life. In the brain, these adult NSCs reside in both the “subventricular zone” (SVZ) adjacent to the ventricles and in the dentate gyrus (DG) located in a part of the brain called the hippocampus, which is involved in learning and memory. Adult progenitor cells, which are more restricted with regards to the types of cells that they can become, are found throughout the brain and spinal cord 2. In response to seizures, traumatic injury or ischemia, cells in the rodent SVZ are induced to proliferate. They subsequently migrate into lesions where they differentiate into neurons or astrocytes. Similar “activation” of NSCs in the SVZ has been observed in demyelinating diseases that are characterized by destruction of the myelin sheath, a structure that wraps around nerve fibers and enhances their conduction velocities. In rodent models of demyelinating diseases and in patients with multiple sclerosis, NSCs from the SVZ and progenitor cells from other areas can be recruited to demyelinating lesions. These cells can differentiate into oligodendrocyte progenitor cells that mature into myelin-forming oligodendrocytes 3-7. Similarly, progenitor cells outside the SVZ can be recruited to lesions. However, in chronic, older lesions, NSCs and progenitor cells fail to replace dead or damaged cells 8-12. Evolving evidence supports the hypothesis that inhibitory signals in the microenvironments of chronic lesions may prevent NSCs and progenitor cells from repairing CNS lesions. Strategies that will promote CNS repair will therefore require an understanding of the signals that regulate NSC and progenitor cell differentiation and maturation, both during normal development and following injury. Injury to the CNS is typically followed by a process called astrogliosis, during which astrocytes undergo morphologic and metabolic changes that include the formation of a “glial scar” that isolates damaged from unaffected tissues. In addition, astrocytes have numerous homeostatic activities that include the clearance of extracellular glutamate, the maintenance of extracellular ion and fluid balance, free radical scavenging, and the production of pro- and anti-inflammatory mediators 13, 14. Although these activities are highly beneficial to injured CNS tissues, such glial scarring is often associated with failure of axonal regeneration 15 and remyelination 16. Thus, although reactive astrocytes may be required for the repair of less severe acute CNS lesions, the glial scars seen in larger chronic lesions have long-term deleterious effects on CNS repair. Here, we review evidence that supports the hypothesis that hyaluronan, a glycosaminoglycan that is widely distributed throughout the CNS both in adults and embryos, regulates the maintenance of a variety of adult and embryonic stem cell populations. We further postulate that the same mechanisms by which hyaluronan regulates stem cell quiescence and differentiation in stem cell niches may block progenitor cell differentiation and maturation in the microenvironments of CNS lesions, thus preventing the repair of the CNS. The structural and biochemical microenvironment that confers stemness upon cells in multicellular organisms is referred to as the stem cell niche. Stem cell niches exist in diverse organ systems in vertebrates but they share general components such as a location in the proximity of blood vessels, common sets of growth factors, and extensive extracellular matrix. Hyaluronan may serve as a niche component for numerous stem cell populations. For example, hyaluronan is abundant in skeletal bone 17 where it can influence the “stemness” of hematopoietic stem cells (HSCs; capable of reconstituting all blood cells) as well as mesenchymal stem cells (MSCs; capable of reconstituting cells of mesodermal origin other than blood cells). Both HSCs and MSCs reside in specific locations within the bone marrow. Hyaluronan is present on the surface of both murine and human HSCs 18, 19. A functional role for this hyaluronan was demonstrated in a study showing that 5-fluoro-uracil, a chemotherapeutic drug that induces bone marrow hypoplasia and leucopenia, results in the loss of hyaluronan from the HSC niche in mice 20. Remarkably, systemic injection of hyaluronan into mice accelerated the recovery of hematopoiesis in these animals 20. Similarly, when murine bone marrow cells were depleted by irradiation, transplantation of HSCs expressing hyaluronan on their surface led to higher survival rates than transplantation of cells not expressing hyaluronan 19. The higher survival rates correlated with the effect of hyaluronan on the lodging of HSCs to the endosteum, the part of the bone shown to provide the niche microenvironment for HSCs. Consistent with these findings, pretreatment of HSCs with hyaluronidase prior to transplantation decreased the number of cells correctly lodging to the endosteum 19. The mechanism by which hyaluronan promotes homing and lodging of transplanted stem cells may involve the direct activation of cell signaling by hyaluronan in HSCs. When hyaluronan on HSCs is bound by a hyaluronan-binding protein, mimicking the lodging of HSCs in the proximity of cells within the niche, both proliferation as well as differentiation were profoundly decreased 19. These results show that the expression of hyaluronan on stem cells can strongly influence cellular behavior. Hyaluronan is used therapeutically to promote regeneration following cartilage damage 21 and polymerized versions of hyaluronan serve as scaffolds for MSC grafts in wounds to enhance the production of appropriate tissue 22, 23. The hyaluronan matrix ensures survival of the grafted stem cells while successive breakdown of the hyaluronan matrix by endogenous hyaluronidases is likely to release the contained cells to let them contribute to tissue regeneration. Similarly, human embryonic stem cells (hESCs) cultured in hyaluronan hydrogels remain undifferentiated but regain the ability to differentiate upon enzymatic removal of the hyaluronan matrix 24. The influence of hyaluronan on HSCs, MSCs and hESCs highlights that cells located in a hyaluronan-rich microenvironment experience structural support from extracellular hyaluronan and acquire a quiescent state with low levels of proliferation. This quiescence is concomitant with prolonged survival and the maintenance of stem cell populations in a manner that permits them to proliferate and differentiate when the need arises. The role of hyaluronan in regulating NSC and progenitor cell populations is slowly emerging from studies of both development and disease. Hyaluronan is widely distributed throughout the developing CNS. In the chick, hyaluronan is present in the developing VZ but appears to be at highest concentrations in the intermediate zone (IZ; Fig. 1), which later gives rise to the white matter 25. However, in adult animals, including mammals, hyaluronan is more diffuse in white matter where it localizes around myelinated fibers. In gray matter, hyaluronan accumulates around neuron cell bodies in perineuronal nets that have been implicated in regulating neuronal excitability and plasticity 26-30. The differences in hyaluronan localization and density may influence NSC migration. There is extensive evidence supporting a role for hyaluronan in regulating neural crest cell migration from the dorsal neural tube (Fig. 1). The neural crest is a transient stem cell population that gives rise to all of the cells in the peripheral nervous system (PNS) as well as pigment cells in the skin (called melanocytes) and a variety of other cell types. The cells that give rise to the PNS migrate through the anterior sclerotome and form peripheral ganglia and nerves. Hyaluronan can promote the separation of neural crest cells from the dorsal neural tube, suggesting that it may be required for initiation of crest cell emigration 31. Consistent with this finding, Ori and co-workers 32 found that morpholino-mediated loss-of-function of the Xenopus hyaluronan synthase-2 gene resulted in the failure of trunk neural crest cell migration. It is unclear whether hyaluronan is similarly involved in NSC migration either from the VZ or other germinal zones. 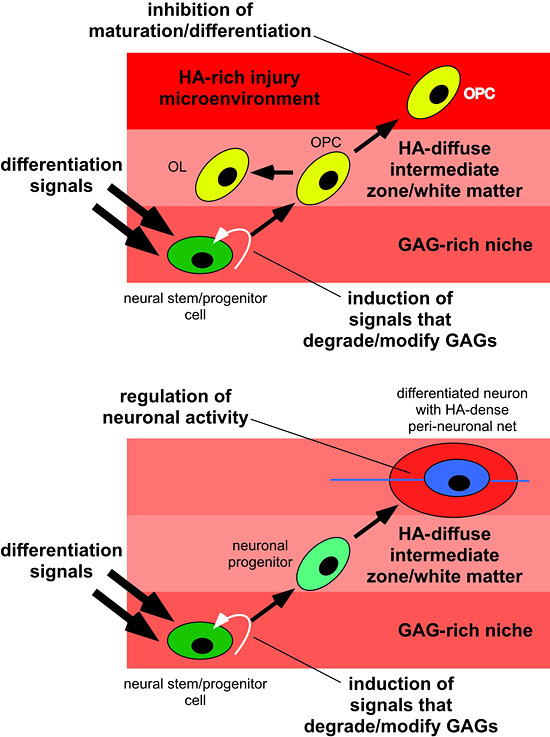 In addition to regulating neuronal function and cell migration, hyaluronan may influence NSC and progenitor cell differentiation and maturation. One of the first hints supporting a role for hyaluronan in progenitor cell maturation came from Marret and co-workers 33 who found that so-called O2A cells, which can differentiate into either astrocytes or oligodendrocytes in vitro, fail to mature into oligodendrocytes if the cultures were supplemented with hyaluronan. Our lab subsequently demonstrated that hyaluronan accumulates in chronic demyelinated lesions from patients with multiple sclerosis and in mice with experimental autoimmune encephalomyelitis, a mouse model of multiple sclerosis 16. Hyaluronan accumulation was also observed in CNS tissues that ectopically express the hyaluronan receptor CD44 under the control of a myelin-specific promoter, and which demonstrate dysmyelination throughout the CNS 16, 34, and also in rats with spinal cord crush injuries, which have significant astrogliosis and demyelination 35. The highest density of hyaluronan appears in completely demyelinated areas of lesions, while areas where there is some remyelination have less hyaluronan 16. We found that the presence of hyaluronan either in vivo or in vitro blocked the maturation of oligodendrocyte progenitor cells into myelin-forming oligodendrocytes 16, thus supporting the hypothesis that hyaluronan blocks remyelination by maintaining progenitor cells in an undifferentiated or immature state. NSCs may be influenced similarly by exposure to hyaluronan in stem cell niches and in injury microenvironments, where they may synthesize their own pericellular hyaluronan. The intermediate filament protein nestin serves as a marker for embryonic neural stem/progenitor cells. Interestingly, the same set of transcription factors indispensable for gene activation at the nestin promoter, namely Sp1 and Sp3 36, are involved in the activation of transcription from the hyaluronan synthase-2 promoter 37. We recently examined hyaluronan expression in an in vitro model of NSC niches to further ascertain whether NSCs make their own hyaluronan. When grown in vitro, NSCs form “neurospheres”  balls of cells that include both differentiated and undifferentiated populations of neural cells, including NSCs that are maintained due to their interactions with extracellular matrix and differentiated cells within the sphere. In many respects, neurospheres recapitulate the NSC niche environment in vivo 38. In Fig. 2, we show that the external portion of these neurospheres, where the NSCs reside, is rich in hyaluronan not unlike the VZ or SVZ. It is possible therefore that hyaluronan generated by NSCs can itself maintain the stemness of NSCs the way it maintains other stem cell populations discussed above. Hyaluronan is synthesized by neural stem/progenitor cells cultured as neurospheres. 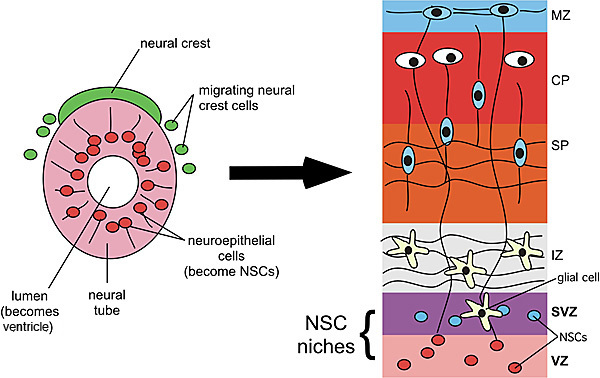 NSCs were derived from postnatal day 1 mouse brains and cultured as free-floating neurospheres. 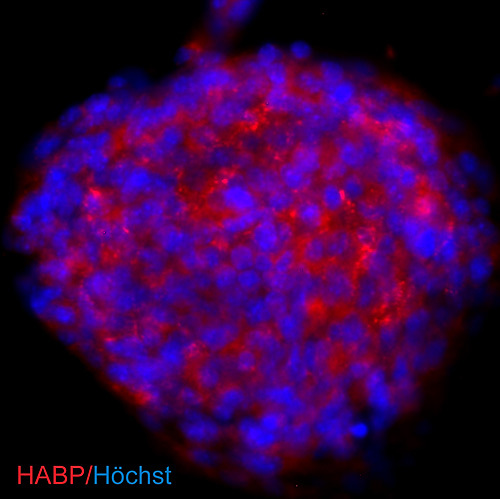 To visualize hyaluronan produced by cells in the sphere, cells were incubated with a biotinylated hyaluronan-binding protein that was then detected using streptavidin-coupled Cy3 (red). Nuclei were counterstained with Höchst 33342 (blue). Hyaluronan serves as a backbone for the formation of large multi-molecular complexes with proteoglycans of the aggrecan/lectican/hyalectin family. The core proteins of these proteoglycans (termed aggrecan, neurocan, versican and brevican) have conserved hyaluronan binding regions, which establish connections to hyaluronan molecules. These connections are stabilized by link proteins that bind both the hyaluronan chain as well as the associated proteoglycan. Chondroitin sulfate proteoglycans (CSPGs) were detected in the SVZ in mice 39, 40, and the aggrecan gene was shown to be transcribed in the germinal zone of the perinatal rat brain 41. Furthermore, neurocan protein has been detected immunocytochemically in neural stem/progenitor cells cultured as neurospheres 39, 40, and such spheres express transcripts for aggrecan and brevican as well 39. Interestingly, aggrecan and neurocan expression are downregulated after culturing neurospheres for 14 days under differentiating conditions 39. Together, these data demonstrate that aggrecan/lectican/hyalectin family members are part of the NSC niche and that neural stem/progenitor cells are capable of creating their own niche environment. Since all aggrecan/lectican/hyalectin proteoglycans have the ability to associate with hyaluronan, these data strongly suggest that hyaluronan might play a profound role in the composition and organization of extracellular matrix in the NSC niche. Hyaluronan could indeed fulfill the function of a “stemness” factor - either directly through activation of hyaluronan receptors or indirectly by either “walling off” NSCs from cell-cell-contacts or by mediating the activities of proteoglycans. Stern 42 proposed that the appearance of hyaluronan in the phylogenetic tree might be correlated with the requirement arising in metazoan animals for specialized niches separating pluripotential stem cells from the remainder of terminally differentiated somatic cells. How could we envisage such a compartmentalization in the developing and injured CNS? The amount of brain-associated hyaluronan changes dramatically during embryogenesis and through adulthood 43, and, as we have discussed, following injury to the CNS. During development, these quantitative changes are accompanied by dynamic changes of distribution and association of hyaluronan with specific cell populations during the neurogenic period 25, 44. Here, we have reviewed evidence that hyaluronan itself as well as hyaluronan-binding proteoglycans are expressed by neural stem/progenitor cells in vitro, and that hyaluronan-binding proteoglycans localize to the NSC niche in vivo. It thus seems very likely that during development, hyaluronan and hyaluronan-binding proteoglycans become deposited around cells that are committed to become NSCs. Cells in the NSC niche of the adult rat brain are tightly surrounded by structures termed fractones (Fig. 3), which represent finger-like continuations of basal lamina originating from cortical capillaries that reach into the SVZ 45. Basal laminae do not necessarily contain hyaluronan, yet they have been shown to create a barrier for the diffusion of free hyaluronan 46. Thus, in addition to hyaluronan linking with proteoglycans, fractones might present a means to retain hyaluronan in the niche to ensure the initiation and continuation of NSC quiescence. 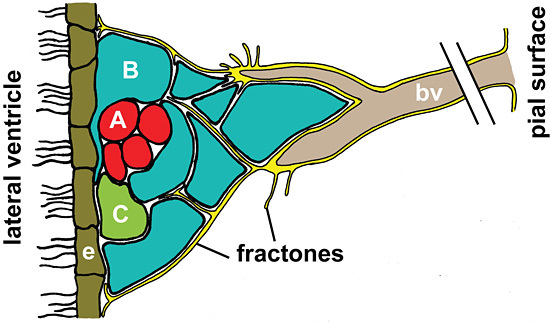 Schematic representation of fractones in the neural stem cell niche. Fractones (yellow) are laminin-rich structures continuous with the basal lamina (yellow) of blood vessels (bv). They project into the subventricular zone (SVZ) and terminate in tips closely associated with the multi-ciliated ependymal cells (e) lining the lateral ventricle. Fractones are in direct contact with the stem and progenitor cells of the SVZ shown in blue (type B cells), green (type C cells) and red (type A cells). In the neural stem cell niche shown here, Type A cells are proliferating neuroblasts migrating rostrally to the olfactory bulb while type C precursor cells are stationary yet rapidly dividing cells. Type B cells have astrocytic features and are considered the stem cells of the adult brain. They are dividing slowly and ensheath migrating type A cells with extensive cellular processes 48. The presence of basal lamina and its proximity to the cells in the SVZ could provide a scaffold for HA in extracellular spaces. Retention of HA in the SVZ could in turn influence stem cell quiescence and HA processing upon external stimuli could induce stem cells to produce rapidly dividing progenitor cells. Regional differences in hyaluronan, both by itself and associated with proteoglycans, may help dictate how and when NSCs leave the niche and start to differentiate into neurons or glial cells. As cells differentiate and come to reside in different regions of the CNS, they may enter domains that have different quantities or qualities (e.g. sizes) of hyaluronan which then influence their further maturation or function. Cells may also upregulate their own expression of hyaluronan that influences their behavior (e.g. in perineuronal nets). These distinct potential functions for hyaluronan are illustrated in Fig. 4. Hyaluronan regulates multiple functions of NSCs and differentiated neurons and glia. The top panel is an example of NSCs in a niche (e.g. the SVZ) migrating into white matter. This migration and initiation of differentiation may require that cells change the hyaluronan-based matrix around themselves by altering hyaluronan synthase activity or hyaluronidase activity. In the diffuse hyaluronan matrix of normal white matter, these cells will differentiate into oligodendrocyte or glial progenitors that stand ready to replace dead or damaged oligodendrocytes by differentiating into myelin-forming oligodendrocytes. If cells encounter an area where there is extensive gliosis and an accumulation of hyaluronan, they fail to mature into oligodendrocytes and cannot remyelinate areas of damage. The bottom panel illustrates how cells may alter their pericellular matrix as they migrate and differentiate. NSCs in the SVZ or VZ, for example, can be induced to differentiate into neurons through various signals in addition to signals that alter the hyaluronan-based matrix, as above. Upon reaching their final destination in gray matter, neurons express high levels of hyaluronan that contribute to peineuronal nets that are required for the maintenance of neuronal activity. We postulate that hyaluronan deposition might occur as a way of limiting NSC and neural progenitor cell differentiation. This raises the question of how hyaluronan synthesis and deposition are regulated in NSC niches. One possibility is that hyaluronan synthesis increases concomitant with the ongoing specification of NSCs. This would require either enhanced production of hyaluronan by hyaluronan synthases or an upregulation of the transcription/translation of hyaluronan synthase genes. As noted above, transcription factors that regulate at least one NSC marker also regulate the expression of a hyaluronan synthase, suggesting that maintaining the stem cell state may also promote hyaluronan accumulation in the niche. Our findings in Fig. 2 are consistent with this idea. Alternatively, hyaluronan production might be constant over neural development but the breakdown of hyaluronan or turnover of hyaluronan-binding proteins might decrease specifically around neural stem cells in order to facilitate hyaluronan accumulation. In support of this notion, Polansky and co-workers 47 found that hyaluronidase activity is elevated during early stages of chick brain development then declines at hatching. It is possible, therefore, that the balance between hyaluronan synthase and hyaluronidase transcription and activity dictate how and when NSCs leave the niche and whether or not cells recruited to sites of injury are able to contribute to nervous system repair. Another consideration is whether other enzymes that break down hyaluronan into its constituent monosaccharides (D-glucuronic acid and D-N-acetylglucosamine) are regulated the way hyaluronidases are in the developing CNS and, in particular, by cells in NSC niches. It is possible, for example, that NSCs themselves or other cells in the niche express hyaluronidases that break down higher molecular weight forms of hyaluronan into oligosaccharides that have their own distinct biological activities. These questions, as well as understanding how the activities of different groups of hyaluronan receptors influence NSC and progenitor cell differentiation, are key challenges in defining how hyaluronan regulates NSC behaviors in development and disease. This work was supported by grants from the NIH (NS056234) and the National Multiple Sclerosis Society (RG3512A2) to Larry S. Sherman. We thank Steven Matsumoto for helpful comments and suggestions. 1. Gage FH. Mammalian neural stem cells. Science, 287,1433-8, 2000. 2. Carmen J, Magnus T, Cassiani-Ingoni R, Sherman L, Rao MS, Mattson MP. Revisiting the astrocyte-oligodendrocyte relationship in the adult CNS. Prog Neurobiol. 82, 151-62, 2007. 3. Nait-Oumesmar B, Decker L, Lachapelle F, Avellana-Adalid V, Bachelin C, Van Evercooren AB. Progenitor cells of the adult mouse subventricular zone proliferate, migrate and differentiate into oligodendrocytes after demyelination. Eur J Neurosci. 11, 4357-66. 1999. 4. Picard-Riera N, Decker L, Delarasse C, Goude K, Nait-Oumesmar B, Liblau R, Pham-Dinh D, Evercooren AB. Experimental autoimmune encephalomyelitis mobilizes neural progenitors from the subventricular zone to undergo oligodendrogenesis in adult mice. Proc Natl Acad Sci U S A. 99:13211-6, 2002. 5. Decker L, Durbec P, Rougon G, Evercooren AB. Loss of polysialic residues accelerates CNS neural precursor differentiation in pathological conditions. Mol Cell Neurosci. 19:225-38, 2002. Menn B, Garcia-Verdugo JM, Yaschine C, Gonzalez-Perez O, Rowitch D, Alvarez-Buylla A. Origin of oligodendrocytes in the subventricular zone of the adult brain. J Neurosci. 26:7907-18, 2006. 7. Nait-Oumesmar B, Picard-Riera N, Kerninon C, Decker L, Seilhean D, H?glinger GU, Hirsch EC, Reynolds R, Baron-Van Evercooren A. Activation of the subventricular zone in multiple sclerosis: evidence for early glial progenitors. Proc Natl Acad Sci U S A. 104:4694-9, 2007. 8. Scolding N, Franklin R, Stevens S, Heldin CH, Compston A, Newcombe J. Oligodendrocyte progenitors are present in the normal adult human CNS and in the lesions of multiple sclerosis. Brain. 121:2221-8, 1998. 9. Wolswijk G. Chronic stage multiple sclerosis lesions contain a relatively quiescent population of oligodendrocyte precursor cells. J Neurosci. 18:601-9, 1998. 10. Wolswijk G. Oligodendrocyte precursor cells in the demyelinated multiple sclerosis spinal cord. Brain. 125:338-49, 2002. 11. Chang A, Nishiyama A, Peterson J, Prineas J, Trapp BD. NG2-positive oligodendrocyte progenitor cells in adult human brain and multiple sclerosis lesions. J Neurosci. 20:6404-12, 2000. 12. Sofroniew MV. Reactive astrocytes in neural repair and protection. Neuroscientist. 11:400-7, 2005. 13. Pekny M, Nilsson M. Astrocyte activation and reactive gliosis. Glia. 50:427-34, 2005. 14. Fitch MT, Silver J. CNS injury, glial scars, and inflammation: Inhibitory extracellular matrices and regeneration failure. Exp Neurol. 209:294-301, 2008. 15. Back SA, Tuohy TM, Chen H, Wallingford N, Craig A, Struve J, Luo NL, Banine F, Liu Y, Chang A, Trapp BD, Bebo BF Jr, Rao MS, Sherman LS. Hyaluronan accumulates in demyelinated lesions and inhibits oligodendrocyte progenitor maturation. Nat Med. 11:966-72, 2005. 16. Fraser JR, Laurent TC, Laurent UB. Hyaluronan: its nature, distribution, functions and turnover. J Intern Med. 242:27-33, 1997. 17. Khaldoyanidi S, Moll J, Karakhanova S, Herrlich P, Ponta H. Hyaluronate-enhanced hematopoiesis: two different receptors trigger the release of interleukin-1beta and interleukin-6 from bone marrow macrophages. Blood. 94:940-9, 1999. 18. Khaldoyanidi S, Moll J, Karakhanova S, Herrlich P, Ponta H. Hyaluronate-enhanced hematopoiesis: two different receptors trigger the release of interleukin-1beta and interleukin-6 from bone marrow macrophages. Blood. 94:940-9, 1999. 19. Nilsson SK, Haylock DN, Johnston HM, Occhiodoro T, Brown TJ, Simmons PJ. Hyaluronan is synthesized by primitive hemopoietic cells, participates in their lodgment at the endosteum following transplantation, and is involved in the regulation of their proliferation and differentiation in vitro. Blood. 101:856-62, 2003. 20. Matrosova VY, Orlovskaya IA, Serobyan N, Khaldoyanidi SK. Hyaluronic acid facilitates the recovery of hematopoiesis following 5-fluorouracil administration. Stem Cells. 22:544-55, 2004. Kang SW, Bada LP, Kang CS, Lee JS, Kim CH, Park JH, Kim BS. Articular cartilage regeneration with microfracture and hyaluronic acid. Biotechnol Lett. 30:435-9, 2008. 22. Radice M, Brun P, Cortivo R, Scapinelli R, Battaliard C, Abatangelo G. Hyaluronan-based biopolymers as delivery vehicles for bone-marrow-derived mesenchymal progenitors. J Biomed Mater Res. 50:101-9, 2000. 23. Angele P, Johnstone B, Kujat R, Zellner J, Nerlich M, Goldberg V, Yoo J. Stem cell based tissue engineering for meniscus repair. J Biomed Mater Res A. [Epub ahead of print], 2007. 24. Gerecht S, Burdick JA, Ferreira LS, Townsend SA, Langer R, Vunjak-Novakovic G. Hyaluronic acid hydrogel for controlled self-renewal and differentiation of human embryonic stem cells. Proc Natl Acad Sci U S A. 104:11298-303, 2007. 25. M?sz?r Z, Felszeghy S, Veress G, Matesz K, Sz?kely G, M?dis L. Hyaluronan accumulates around differentiating neurons in spinal cord of chicken embryos. Brain Res Bull. 75:414-8, 2008. 26. Asher R, Perides G, Vanderhaeghen JJ, Bignami A. Extracellular matrix of central nervous system white matter: demonstration of an hyaluronate-protein complex. J Neurosci Res. 28:410-21, 1991. 27. Bignami A, Asher R. Some observations on the localization of hyaluronic acid in adult, newborn and embryonal rat brain. Int J Dev Neurosci.10:45-57, 1992. 28. Bignami A, Perides G, Asher R, Dahl D. The astrocyte--extracellular matrix complex in CNS myelinated tracts: a comparative study on the distribution of hyaluronate in rat, goldfish and lamprey. J Neurocytol. 21:604-13, 1992. 29. Baier C, Baader SL, Jankowski J, Gieselmann V, Schilling K, Rauch U, Kappler J. Hyaluronan is organized into fiber-like structures along migratory pathways in the developing mouse cerebellum. Matrix Biol. 26:348-58, 2007. 30. Costa C, Tortosa R, Dom?nech A, Vidal E, Pumarola M, Bassols A. Mapping of aggrecan, hyaluronic acid, heparan sulphate proteoglycans and aquaporin 4 in the central nervous system of the mouse. J Chem Neuroanat. 33:111-23, 2007. 31. Luckenbill-Edds L, Carrington JL. Effect of hyaluronic acid on the emergence of neural crest cells from the neural tube of the quail, Coturnix coturnix japonica. Cell Tissue Res. 252:573-9, 1988. 32. Ori M, Nardini M, Casini P, Perris R, Nardi I. XHas2 activity is required during somitogenesis and precursor cell migration in Xenopus development. Development. 133:631-40, 2006. 33. Marret S, Delpech B, Delpech A, Asou H, Girard N, Courel MN, Chauzy C, Maingonnat C, Fessard C. Expression and effects of hyaluronan and of the hyaluronan-binding protein hyaluronectin in newborn rat brain glial cell cultures. J Neurochem. 62:1285-95, 1994. 34. Tuohy TM, Wallingford N, Liu Y, Chan FH, Rizvi T, Xing R, Bebo B, Rao MS, Sherman LS. CD44 overexpression by oligodendrocytes: a novel mouse model of inflammation-independent demyelination and dysmyelination. Glia. 47:335-45, 2004. 35. Struve J, Maher PC, Li YQ, Kinney S, Fehlings MG, Kuntz C 4th, Sherman LS. Disruption of the hyaluronan-based extracellular matrix in spinal cord promotes astrocyte proliferation. Glia. 52:16-24, 2005. 36. Cheng L, Jin Z, Liu L, Yan Y, Li T, Zhu X, Jing N. Characterization and promoter analysis of the mouse nestin gene. FEBS Lett. 565:195-202, 2004. 37. Monslow J, Williams JD, Fraser DJ, Michael DR, Foka P, Kift-Morgan AP, Luo DD, Fielding CA, Craig KJ, Topley N, Jones SA, Ramji DP, Bowen T. Sp1 and Sp3 mediate constitutive transcription of the human hyaluronan synthase 2 gene. J Biol Chem. 281, 18043-50, 2006 . 38. Campos LS. Neurospheres: insights into neural stem cell biology. J Neurosci Res. 78:761-9, 2004. 39. Neural precursors express multiple chondroitin sulfate proteoglycans, including the lectican family. Biochem Biophys Res Commun. 318:955-63, 2004. 40. Ida M, Shuo T, Hirano K, Tokita Y, Nakanishi K, Matsui F, Aono S, Fujita H, Fujiwara Y, Kaji T, Oohira A. Identification and functions of chondroitin sulfate in the milieu of neural stem cells. J Biol Chem. 281:5982-91, 2006. 41. Baud O, Daire JL, Dalmaz Y, Fontaine RH, Krueger RC, Sebag G, Evrard P, Gressens P, Verney C. Gestational hypoxia induces white matter damage in neonatal rats: a new model of periventricular leukomalacia. Brain Pathol. 14:1-10, 2004. 42. Stern R. Devising a pathway for hyaluronan catabolism: are we there yet? Glycobiology. 13:105R-115R, 2003. 43. Margolis RU, Margolis RK, Chang LB, Preti C. Glycosaminoglycans of brain during development. Biochemistry. 14:85-8. 1975. 44. van Straaten HMW, Hooper KC, Bernfield M. Hyaluronan disappears intercellularly and appears at the basement membrane region during formation of embryonic epithelia. Develop Growth Differ. 32:505-11, 1990. 45. Mercier F, Kitasako JT, Hatton GI. Anatomy of the brain neurogenic zones revisited: fractones and the fibroblast/macrophage network. J Comp Neurol. 451:170-88, 2002. 46. Tammi RH, Tammi MI, Hascall VC, Hogg M, Pasonen S, MacCallum DK. A preformed basal lamina alters the metabolism and distribution of hyaluronan in epidermal keratinocyte "organotypic" cultures grown on collagen matrices. Histochem Cell Biol. 113:265-77, 2000. 47. Polansky JR, Toole BP, Gross J. Brain hyaluronidase: changes in activity during chick development. Science. 183:862-4, 1974. 48. Doetsch F. A niche for adult neural stem cells. Curr Opin Genet Dev. 13:543-50, 2003.